239 years ago today, Jane Austen was born. I thought we might take a quick survey of her life. 1764-The Reverend George Austen marries Cassandra Leigh. They take up residence at Deane Parsonage in Hampshire. 1765-Brother James was born. Like his sister, James had literary aspirations, but he never knew success. 1766-George Austen was born. Mentally challenged, George was boarded out for most of his life. 1767-Edward Austen was born. Later, he was adopted by Thomas Knight. Because the Knight family had no children, Edward inherited all their property. 1767-The Austens move to Steventon Rectory. 1771-Jane’s brother Henry was born. It was with Henry’s influence that Jane found her publisher. 1774-The first of Jane’s sea-faring brothers, Frank, was born. 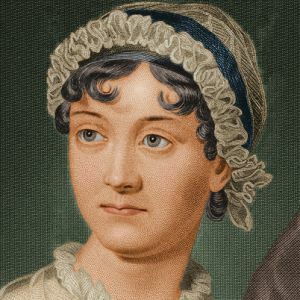 1775-On December 16, Jane Austen is born. 1779-Charles Austen was born. Charles spent seven years in the British navy’s efforts in the West Indies. 1783-Jane nearly dies from typhoid fever, which she contracted while attending a boarding school in Oxford. 1787-Jane’s formal education ends, and she begins to write. She preserves scraps of her early writing in Volume the First. 1793-The last pieces are added to Volume the Third. Jane’s nieces Anna and Fanny Austen are born. 1795-Jane writes Elinor and Marianne. 1796-The first of the letters, which were preserved, are dated from this year. For example, in a January letter, Jane writes of flirting with Tom Lefroy, and in an October one, she tells of beginning First Impressions. 1797-Jane finishes First Impressions. It is offered to the publisher, Cadell, who declines Rev. Austen’s presentation of the manuscript. Jane also begins Sense and Sensibility in 1797. 1798-Jane begins writing Susan. Her nephew (and future biographer), James Edward Austen is born. 1799-Jane finishes Susan. She stays for some time in Queen Square in Bath. 1800-Jane’s parents decide to retire in Bath. 1801-Jane’s parents take a lease on 4 Sydney Place in Bath. 1803–Susan is sold to publisher Crosby. 1804-Jane’s family moves to Green Park Buildings, Bath. 1805-Rev. George Austen dies. Jane begins The Watsons, which she soon abandons. Her family moves to Gay Street in the spring and then to Trim Street in the autumn. 1807-The Austen women (mother, Jane, and Cassandra) take a house with brother Frank and his wife in Castle Square, Southampton. 1808-Brother Edward offers the Chawton cottage to his mother and sisters. 1809-In July, the women move into the Chawton cottage. 1811-Jane begins writing Mansfield Park. In November, Egerton publishes Sense and Sensibility. 1813-In January, Jane releases Pride and Prejudice. By July, Mansfield Park is finished. 1814-Austen begins Emma in the early part of the year. In May, Mansfield Park is published. 1815-Jane begins Persuasion. Emma is published in December. 1816-Sir Walter Scott gives Emma favorable notice in Quarterly Reviews. In August, Jane finishes Persuasion. She takes ill shortly afterwards. 1817-She begins Sanditon, but abandons it due to her health issues. In July, Jane Austen dies. She is buried in Winchester Cathedral. Persuasion and Northanger Abbey are published posthumously with a Biographical Notice written by Henry. This entry was posted in Great Britain, Jane Austen, Living in the Regency, real life tales, Regency era and tagged Jane Austen, timeline. Bookmark the permalink.